The 2015 AAU Junior Olympics concluded on Saturday and the Sonics closed it out with Damario Gee finishing 12th out of 59 in the 10 Boys Turbo Javelin and Kennedy Burgess finishing 40th out of 48 in the 11 Girls Turbo Javelin. The Sonics final medal count was four, two from Octavia Gee (including a national record in the 9 Girls Turbo Javelin), one from Faith Mitchell in the 11 Girls Shot Put, and one from Davon Beckles in the 12 Boys 3000 Meter Run. The medal tally was a bit below the norm for the Sonics, but considering we only brought 21 athletes and three relay teams, that is not surprising. Next year, however, we will be back on our home turf when the Junior Olympics returns to Houston so we will no doubt have a stronger turnout and greater successes. A big “thank you” goes out to all of the dedicated athletes and parents who made the long journey to Norfolk and we look forward to seeing everyone again next year! Saturday is the final day of competition and the Sonics will have Damario Gee and Kennedy Burgess each competing in the turbo javelin. On tap for Thursday, we have Connor Parker and Davon Beckles running the 1500 meters, Octavia Gee in the Turbo Javelin, and Jayla Cooper in the Long Jump. Plenty more Sonics in action on Wednesday, so be sure to tune into AAUTV.org to follow them on live streaming video. 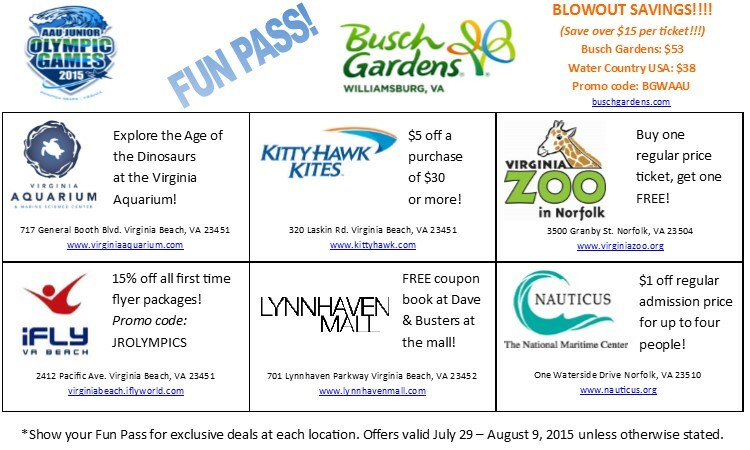 For you families traveling to Virginia for the upcoming Junior Olympics, be sure to check out the Fun Pass, which offers a variety of discounts for local attractions. 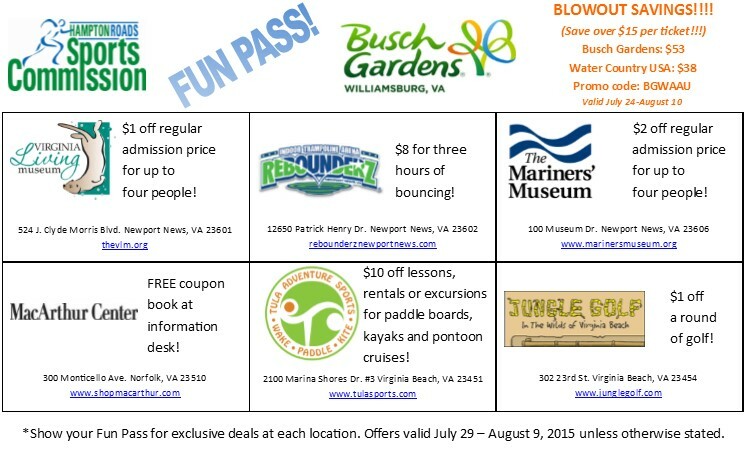 I suspect they will be including a Fun Pass flyer in the athlete packets, but if not, you can always refer to this link to get the details.